I like motorcycles. There are at least as many types of motorcyclists as there are types of motorcycles. There are cruisers, super sports, dirt bikes, dual sports, super motos, and plenty of others. I've always liked dual sports. Dual sports are like street legal dirt bikes, they can go anywhere, do almost anything, and of course, they look really cool. Years ago, I purchased a used 1990 Suzuki DR350S with maybe 1400 miles on it. 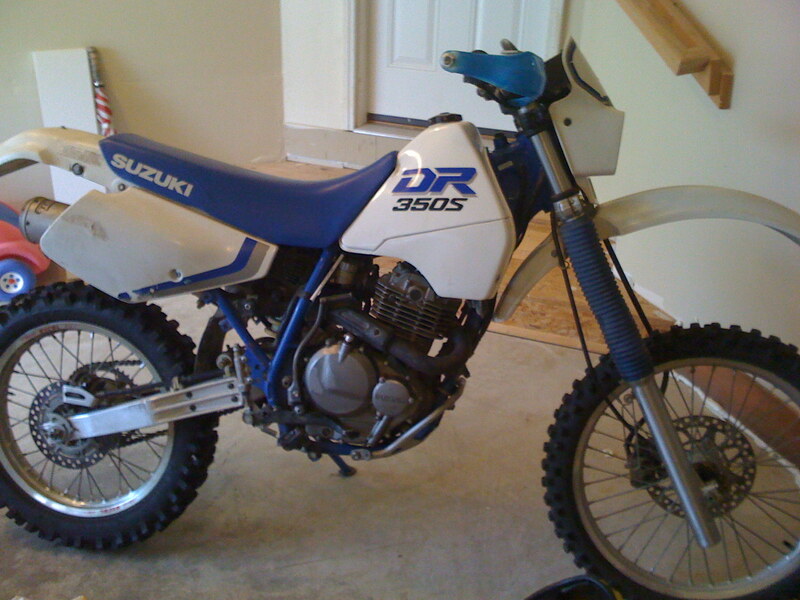 The DR350S is an air cooled, single cylinder kick start motorcycle. It is known for it's simplicity and reliability. It's not exactly a dirt bike, although there is a dirt only model. It's a mid range dual sport in the Suzuki line up. It has since been superseded by the slightly more powerful, liquid cooled DR-Z400S. I didn't have much time to ride it for years, so it sat in the garage for a loooong time. In fact, it hadn't run for as long as six years or so. The good thing is that was safe from the elements, so it stayed in good shape. At one time, I considered selling it, but upper management convinced me it was a nice bike and I should keep. That was great advice. In May of 2009, I decided to restore the bike to running status. The battery had long since died, so I replaced it with a bank of capacitors totaling about 33,000 µF. This actually works because kick start DRs don't need a battery to run, but the filtering is required to avoid large spikes from the lighting coils. The first problem I noticed was a frozen front brake. It turned out to be a clogged brake line about a couple of inches below the front master cylinder. I cleared it out an Ernie Ball Super Slinky Low E guitar string, and replaced all fluids. The gas tank was a real mess. It still had something that used to be gas in it, but there was a bit of visible rust. I drained the tank and cleaned the petcock, which was a real mess. I filled it with fresh gas and started kicking. Like a lot of high compression singles, the kick start DRs have a decompression lever that helps the rider find top dead center (TDC) before giving it a solid kick. It's ritual that requires a bit of experience, but not hard once you figure it out. I kicked, and kicked, and kicked, and kicked some more. Nothing happened. Not a single pop, no signs of life whatsoever. I was really getting discouraged. I posted my problem to Thumpertalk motorcycle forum. Withing a few days, I got all the answers I needed. Motorcycle carburetors have many small passages that are easily clogged with residue from evaporating gas. My bike sat so long that the pilot circuit was completely clogged. After several carb cleaning sessions, gave it few more kicks, but still nothing. I suspected I had weak spark, so I reduced the spark plug gap slightly. That did the trick. One more kick and thump-thump! Finally, some signs of life! One more kick, and it fired up and idled. Although the bike ran, it was from from perfect. The gas tank was full of rust, so I spent quite bit of time removing rust through electrolysis and chemical means. It's still not perfect, so I added an inline fuel filter to be safe. Even still, the stock constant velocity Mikuni carburetor left a lot to be desired. It was highly unreliable. The bike was often difficult to start. I checked everything, cleaned the carburetor several more times, made adjustments, but nothing really helped. Sometimes the bike would run beautifully, other times, it was a mess. It didn't idle well and power was not always reliable. I scoured the internet for some way to get the carburetor running properly. After six months, I had all but given up on my CV carburetor. Around this time, a neighbor was having trouble starting his car. This was rather unusual considering it was fuel injected. Unlike carbureted cars of old, fuel injected cars are very reliable starters. I didn't know anything about fuel injection, other than it was lot more reliable than a carburetor. I couldn't help my neighbor, but I became curious about Fuel injection. What followed next was a wild ride.